The arena is filled with tens of thousands of spectators. A calmed hush descends over the crowd as a regal figure walks forward from the recesses of his private box. He points to the floor below. Two men emerge, and the crowd cheers as the warriors who have fought so valiantly during the day’s games are presented for their approval. Both men have killed countless others during the day. Neither allows himself the luxury of thinking about the cost of his survival. That’s really what it’s all about: survival for the warriors, and entertainment for the crowd. But the crowd hungers for more. They want worthy foes to face the men who have bested all challengers. From his box, the master of ceremonies announces the combatants for the day’s final battle. The two men will fight each other. The winner will be set free from the games, the loser will die at the hands of the winner. The crowd roars. Their lust for battle, for a distraction from the privations of their real lives, is palpable within every atom of the arena. The two warriors refuse to fight at first. A bond of loyalty exists between the strangers made allies through shared bloodshed. The crowd simmers. They could get ugly at any moment. The master declares both will be killed if neither fight, and the arena bends to his will. The crowd is appeased. He knows the games are a dangerous necessity. There is no better way to showcase the futility of resistance than through the games. But no matter what else happens, the games can never become a breeding ground for heroes. Unwilling to be slaughtered, unable to take his own life, one of the warriors makes the first strike. He wants to die at the hands of his brother, not his enemy. It could be a scene from one of Spartacus’ various screen adaptations. Perhaps it’s an excerpt from Ridley Scott’s pitch session for Gladiator? Obviously neither given the title of the post. But who would have thought a pretty, if unremarkable, sequel to Tron would incubate an animated series that dares to march where angels fear to tread? 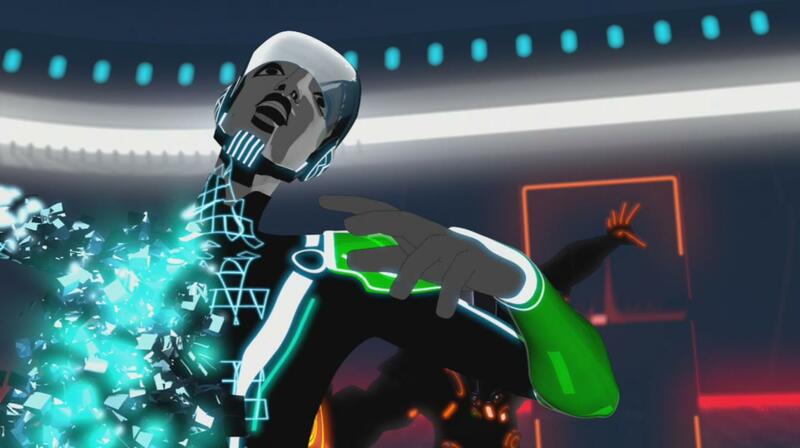 Tron Uprising is a story of terrorism, or freedom fighting, depending on how you look at such things. It’s a story of a hegemonic empire imposing a world view on otherwise free people. We could even make a case for the show as an inquiry into social control through spectacle; what will a people abide so long as you give them bread and circuses? In short, Tron Uprising has restored the philosophical backbone that was essential to the first feature film, but subdued, if not entirely missing, from the Legacy. Only now the discourse has shifted from something that explored Enlightment ideas pertaining to man’s relationship with god to the philosophies of Edmund Burke and Hannah Arendt. In donning the guise of Tron, thought dead at the hands of Clu, Beck, takes up a banner which preaches evil triumphing if good programs do nothing. Moreover Uprising constructs a totalitarian state so that the narrative might safely explore ideas of resistance within it. 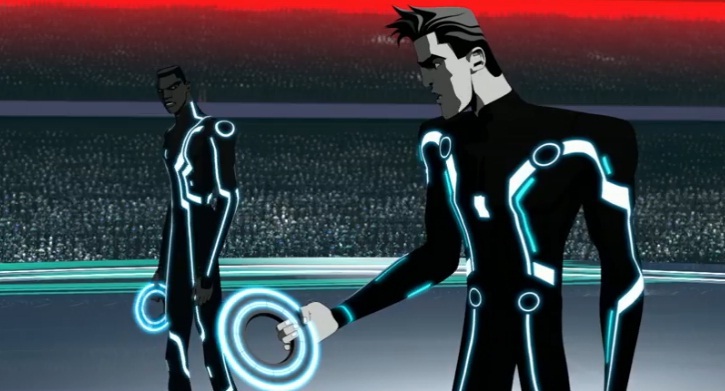 How then does Tron Uprising enact an exploration of such lofty ideas while remaining a Disney branded product? Through exploiting one very simple loophole in standards and practices: that which is not alive can not be killed. Giving the show a prime time spot also helps, but so does that last bit. Allow me to explain. The Grid, the world of Tron, is set inside a computer. Like any computer, The Grid is full of programs. These programs look and sound very much like humans or, as we are known the programs, users. But when a program is cleaved in twain with another program’s identity disc, the weapon of choice within the grid, they don’t die, they de-resolve or in the common parlance, they derezz. The null program takes on the appearance of a piece of cubist art before crumbling into so many bloodless sugar cubes. To other programs, the sight of de-resolution is abhorrent. To the censors, who are primarily concerned with violent visual cues, there’s little ground for objection. Remember that audience emulation is paramount among the concerns of the censor; will an impressionable idiot child attempt to replicate the actions that they see on screen? Should they do so in this case, the result will be an army of children throwing Frisbees at each other. Given North America’s childhood obesity problem, this is hardly something to be eschewed. Within the story, however, the derezzing of a program has all the permanence of death within the human world. There are no “saved” programs or such gimmicks that would invalidate the finality of deresolution. Once you’re derezzed, you’re as good as dead, but conveniently not dead since you were never alive in the first place. The potential payoff for narrative development here is boundless. With derezzing as a practical alternative to death, Uprising can actually explore how/why Clu went about purging the ISOs from The Grid. If said story ends with a camera pan back to a flash of light that sees two million programs getting mass derezzed, then so be it. Why not go on to measure the greater good of programs sacrificing themselves for the idea of Tron against Clu’s attempts to create order as a moral chiaroscuro? Three episodes in and we’ve already seen programs sent to the games to be derezzed as a means of combating Beck’s subversive message of resistance. Extending that to its natural conclusion would make Uprising something that is as laden with political subtext as V for Vendetta. Political, but still something that is safe for the Disney brand. With nobody dying there’s nothing to tarnish the corporations family friendly veneer. The only risk is that Tron Uprising may suffer the same fate as Exo-Squad and Transformers: Beast Machines. Therein both shows had a decidedly grown up subtext, but couldn’t convince adult audiences to watch. Arguably the success of series like The Clone Wars and Avatar: The Last Airbender (pay no attention to the horror show that was the movie of the same name) have done much to legitimize western animation for an adult audience. 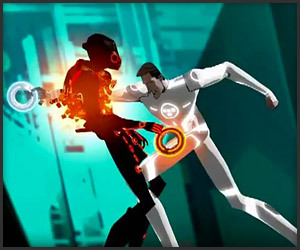 Time will tell of Tron Uprising follows suit.